Boeing is one of the largest and most respected aviation companies in the world. As such, its word carries a lot of weight. Not surprisingly, the company’s “Pilot and Technician Outlook”, an annual report released by the company to look at trends in demand for pilots and technicians, is one of the most closely watched reports in the whole industry. The report was released just last week. 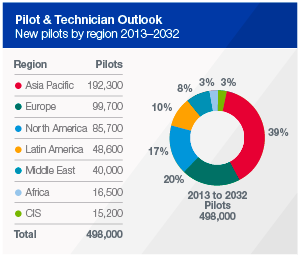 This report outlines growth potential for pilots and technicians over the next 20 years. Obviously, pilots are the people flying the planes from location to location. Technicians refer to the maintenance staff on the ground who take care of the planes and ensure that they are in good working order. Being either a technician or a pilot can ensure a high paying and high prestige job, so either job can be good a career option. So what did Boeing’s must recent report have to say? According to the report, a rapidly growing aviation industry is going to create a huge spike in demand for both pilots and technicians. In fact, the report predicts that over the next 20 years the industry will add 533,000 new pilot jobs and 584,000 technician jobs. Can you guess where most of these new pilot jobs will be created? If you guessed the Asia Pacific, you guessed right. Asia will account for 41 percent of all jobs created as airline companies across the region are projected to expand rapidly. In contrast, Europe and North America will account for only 18 percent and 17 percent of new jobs created, respectively. Similarly, the Asia Pacific will generate the most demand for technicians too, with 38 percent of jobs being created in Asia. That compares with only 17 percent for Europe and 19 percent for North America. Of course, with so many jobs being added in every region, you’ll be in a great position to start your career no matter where you find yourself living. It’s worth noting that the growth of the industry should also create demand for other aviation specialists not considered by the report. Demand for cabin crews, such as stewardesses, and staff on the ground for security and administration purposes should also increase. If Boeing’s prediction turns out to be correct, the next 20 years will be an exciting time to get involved in the aviation field. Of course, no company or person can predict the future, but with more and more people being lifted out of poverty and globalization only accelerating, it’s likely that an increasing number of people will be taking to the skies. This should drive the growth of the industry as a whole.